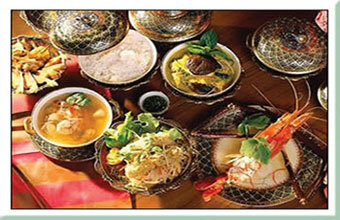 Whether Thai food is your favourite, cooking is a hobby or maybe your just curios. There is no better way to learn how to sizzle up your favourite Thai dishes, than by taking a Thai Cooking Course. Koh Chang Cooking School provide Thai Cooking Courses in an ideal home-style learning environment that is different from most other hotels and restaurants. We offer a variety of fun and educational classes that will teach you how to create popular Thai dishes and how to carve fruits & vegetables. Why not come and Join us and make your vacation on Koh Chang a culinary adventure. Learning the essential skills and techniques you can use in everyday cooking. All of our courses are taught by an experienced and qualified Thai chief. Children who are less than 12 Years old have to do the activity with a responsible adult. Remove jewellery and anything that could get tangled. Tie back your hair and tie on your glasses.